Hier könnt ihr euren Linkshänder-Bass anbieten. Einfach eine Email mit Foto und Beschreibung senden. Ich werde ihn umgehend in das Internet stellen (kostenlos natürlich). Für die Aktualität der Angebote kann ich nicht garantieren. 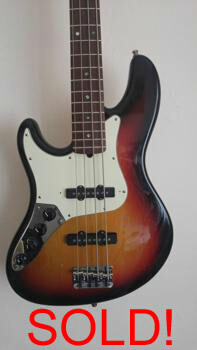 If you like to offer your lefthand bass, please feel free to send me a email with pic and discription. I will publish it asap (for free of course). Sorry, but I can´t proof if these offers are up to date! 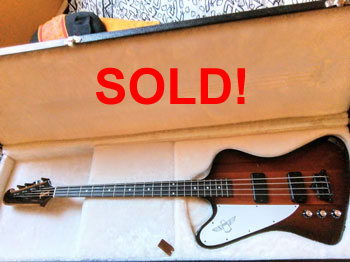 I'm thinking of selling my Gibson Thunderbird Lefty. 2013 made in usa. single-owner. perfect conditions. not a scratch. great sound. 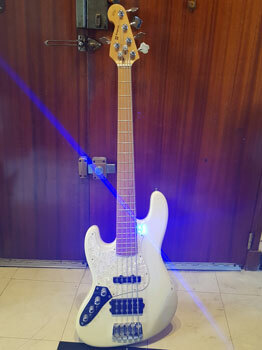 light and balanced bass. Carvin SB 4000. Okt 2013. Active Carvin preamp: Vol, Blend, Vintage tone control,Bass/Treble, 18 volt. Bridge: String through bridge or body. Lock down saddles. These Basses got Editors Award in Bass Player Reviews 1Des. 2009. Won Best Bass in Namm in its release year. And many other gloving reviews. I bought this Bass new. (Carvin has the best customer service anyone can ask for) because of the gloving reviews from Talk Bass and Bass Player. When I got it it exceeded my expectation in every way. And as many has said its quality is like instruments that cost 3 times the price it costed. It balances perfectly seated or standing. The sound is absolutely amazing either passive or active. The neck is the most comfortable I have ever played tung oiled and super fast. The fret work is of the chart, it has the lowest action I have ever seen on a bass with the neck in almost straight position. The price is 520 euros. 3/4 Tsjech handmade doublebass, original made lefthanded. Spruce top, maple back and sides, Rubner machine heads, ebony fingerboard. New endpin installed a year ago. The bass is from the late 1980s. 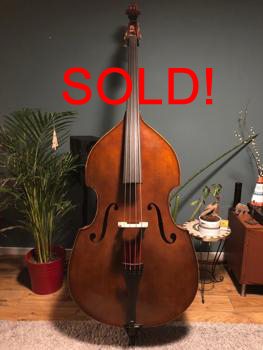 I sell it because I bought a laminated doublebass which is more suitable for my bands music and unfortunately I have no room for two. Sapphire black, maple neck and rosewood fingerboard. Bought new and has never left home. Absolutely new. Zero dings or scratches. 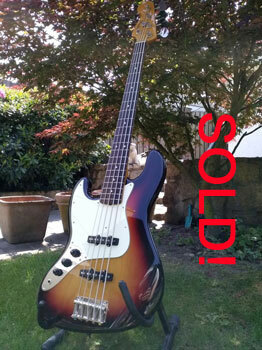 I'll sell used bass from famous polish luthier Roman Koc. Visual condition - see photos - more on request. The bass in in Poland. 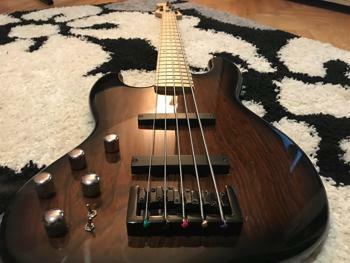 verkauft wird ein Sandberg California TM2 Five-String. Handling und Sound sind ohne wenn und aber wahrhaft phantastisch. Über die Glockenklang-Elektronik wird ein ebenso druckvoller wie diffiziler und klar artikulierter Klang nach außen gegeben, der dazu noch sehr variiert werden kann. Der Bass ist knapp über zwei Jahre alt und in einem so gut wie neuwertigen Zustand. Also weder Dings noch Dongs noch sonstwas. Gekauft wurde er zu einem Preis von 1.775,- . Inclusive eines Tweed-Hardcase wird er für 1.190,-  abgegeben. Zahlung gerne über PayPal. from May 2018. 100% mint condition. new without any scratches. EUR 1.390, shipping in EU included! 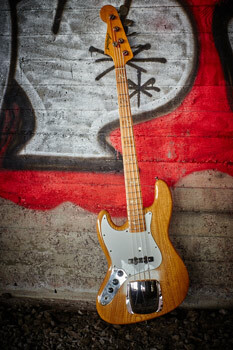 Great vintage japanese Jazz Bass with two-piece Tamo Ash body and bound maple cap neck. All original and in great shape. Precision-type maple neck with rosewood fretboard. Width at nut 43 mm. 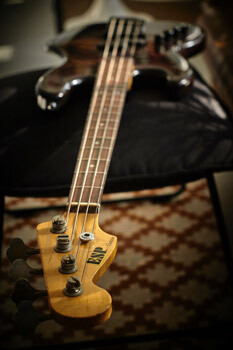 The bass is, IMHO, in good used condition regarding its age (about 30 years). The hardware is quite heavily pitted though, and the neckplate and the knobs for the four pots have been replaced with new parts. This unique piece is located in Finland. Im reluctant to part with this absolutely stellar bass, but, I have an opportunity to buy back a bass that I had custom built for me a few years back so this Carvin has to go to finance the purchase. 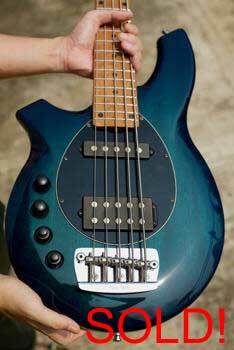 The bass Im looking to get back is a custom bass where I walked into the builders shop and said:•I want that board for the body, that board for the top, that board for the fingerboard, these neck dimensions, and these electronics and this hardware.• A sentimental piece if you will. On to the Carvin. NAMM show 2014 bass, Icon 5P with walnut body wings, flame maple top, 5 piece neck through consisting of 3 pieces of walnut and 2 pieces of maple. Beautiful birdseye maple fingerboard with abalone position markers. Hipshot A-style bridge with piezo saddles. Two single coil (but very quiet) soap bar pickups. Bartolini P2 size I believe. Electronics consist of Master volume push/pull active/passive switch; pickup balance; piezo/mag balance; stacked bass and treble concentric pot; stacked mid freq sweep and boost/cut concentric pot. 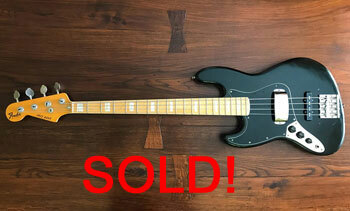 Shortly after I got this bass I bought a brand new F Bass BNF 5, that I sold a while back. 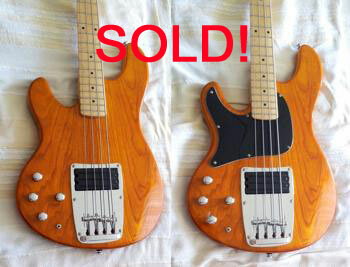 I paid more than twice the money for the F Bass than I did for the Carvin. I did an A/B comparison between them and I honestly had a REALLY hard time justifying the extra money for the F Bass, as beautiful as it was. The quality on the Carvin is VERY close to the F Bass. Its as simple as that. And Carvin really seemed to get it right with the Icon. 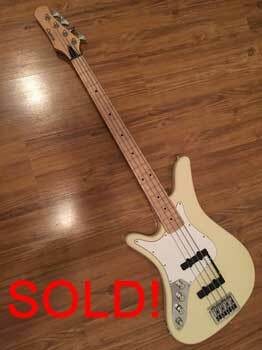 Even Marcel at F Bass commented to me that he didnt know how Carvin was able to build the quality of basses that they turned out and sell them at the price point they do. Very versatile bass tonally and I would say that the walnut sounds like a combo of alder, maple, and mahogany. The maple top and fingerboard give it some nice top end snap as well. This bass weighs pretty much bang on 10 pounds but the balance is perfect and, going back to the F Bass for a second, Marcel Furlanetto told me once that they strive to have their basses come out in that weight area. Maybe just a bit under, but that bit of heft is a factor in the sound. 34• scale, 19mm string spacing at the bridge. Asymmetrical neck. Ive never gigged with this bass and its pretty much dead mint. 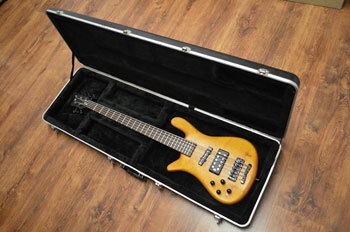 Comes with a Carvin gig bag that is also in perfect condition and I still have the original Carvin shipping box. I can send more photos to anybody thats interested. New, a similarly configured Kiesel bass would be pretty close to $2100 by my calculations. Factory pic attached. Please email for more photos. Im looking for $1750 US or best offer, plus shipping from V9K 1H5 Canada. Do not hesitate to ask questions, more pictures on request. 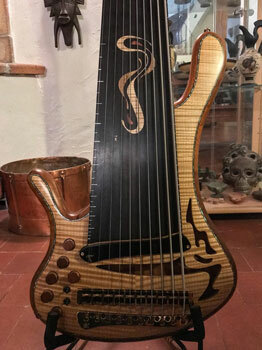 Built in 2010, this is custom-made bass by Alan Cringean of ACG. It has a 5 piece body with Macassar Ebony top and a Wenge back and core along with Sycamore accent veneers. The neck is a 7 piece Flame Sycamore and Macassar Ebony with an acrylic impregnated Flame Sycamore fingerboard with Macassar Ebony binding. It is the third left handed basses that ACG made and is of extremely high standard. It has an ACG EQ01 Filter based 18 volt pre amp (made in conjunction with John East), ACG FB humbuckers and John East low battery indicator with Series/Single/Parallel switches for each pickup. Comes with a Neotech padded strap and Hiscox hardcase. I am looking for 1200 plus shipping. Please get in touch for more pictures and any questions you might have. Für 1400 Euro abzugeben, inklusive Versand in Deutschland. Asking 1400 euros, shipping in Europe: please ask for quote! 2006 Jerzy Drozd Obsession Legend X Yves Carbonne. Its an amazing fretless instrument with a 7-octave range. The lowest note is E one octave below regular low E.
Hi! I´m selling my brand new Eastwood Sidejack. I bought it only five weeks ago (09/03/2018). I´ve played it a couple of times at home. Due to a new job, I have no time to enjoy it and I prefer to selling it instead of hang it on the wall :D I´m selling it with its 3-Years warranty card. I´m not interested in any trade. Thanks a lot beforehand. 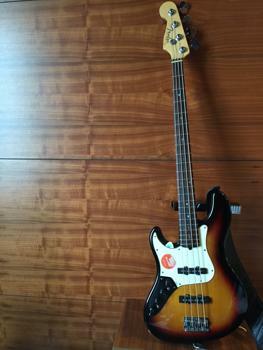 This Sandberg California is worth to Check the sound by the links below.. I'm selling my Rickenfaker, i'm not playing bass anymore with a band since 2014, so this is the first from a batch of basses i'm going to sell in the near future. Please note: this is NOT the original thing. This is a repro (with some variation) of a 60s Rick built for me by a Luthier. 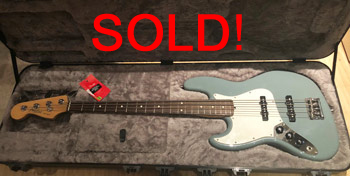 Shipping costs depends on where you want the bass to be shipped, the bass is located in North Italy, comes with soft case. Any question, inquiry of any kind, requests for photo, audio or video etc is welcome. 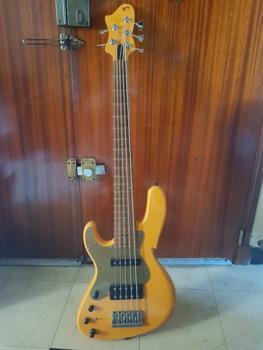 I'm selling a Warwick Streamer Jazzman Lefthanded. 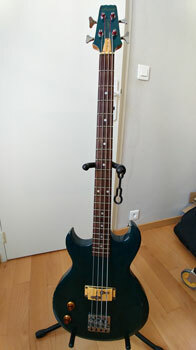 Made in 2005, the bass is in great condition. Looking for 850 plus shipping. Bass is in Bucharest, Romania. Like new, with a beautiful case. Good sound, with and without amp. It has a nice Fishman pickup. im asking 1.600,- or trade with a solid double bass. 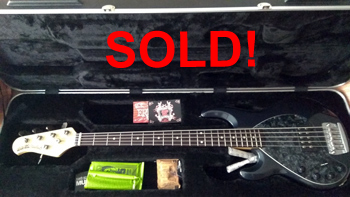 I am selling my 2002 Ken Smith BSRMW6 Lefty. The bass is fully functional and in very good condition. 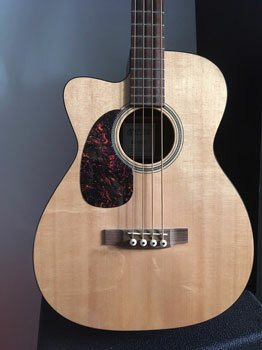 It has seen normal usage with normal fret wear. A few scratches on the side of the bridge pickup and two mounting holes i had to drill into the body for a Midi-Pickup (positioned close to the bridge pickup) are the only cosmetic flaws worth mentioning. Ken Smith basses are known for their distinctive sound. with 22 fret's + Rosewood finger board. Custom Thumb Rest on the Sound Hole . 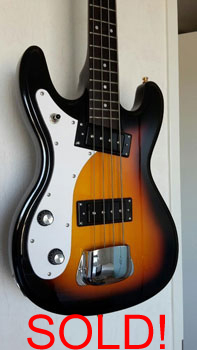 For sale an Eastwood Hi-Flyer shortscale bass. This bass is easy to play. It has an oldschool sound. The condition is good, and still comes with guarantee. Asking price is 300 euro. Shipping from Holland. 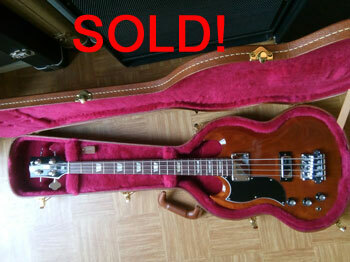 Selling this early Sandberg TM5 custom shop. Early 2 band glockenklang preamp , active passive(no tone in passive), Delano pickups. 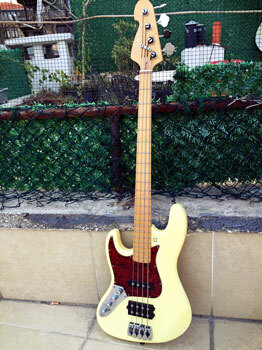 Japanese Bass from the early 80s. A lot of scratchs, « vintage ». Strings GHS 45-105, sounds like a Fender Precision. Delivered with Fender bag and strap. 250 + shipping from France. Contact : stefix33@gmail.com for more infos and pics. European lefty double bass, as new. Asking 1700 euro. Collection from Antwerp, Belgium only. All the original parts, included the left-handed Fender case. The bass is in great condition with a very straight neck. Im looking for 3800 for it. I sell it because the short scale is not for me. the bass is really new / mint condition. I have not even removed the pickguard plastic. the new SG is balanced (Gibson has put a strong bridge to the body for balancing) and always light. Alder body with flamed maple top, neck and fingerboard birdseye maple. Transparent black finish, matched headstock and black neck binding. Including original gigbag, strap, security locks. Recently adjusted intonation, no string buzzing etc, For it´s age in an awesome condition. With it you´ll get the Wal-Case, but you can see the age on it; I think it´s only useful for shipping. Price: 4000 including shipping or a reasonable offer. 1995 USA made 3EQ Musicman Stingray, fretless lefty. Amazing flame maple neck/fingerboard that has been made fretless some years ago by a previous owner, Hipshot D-tuner (original supplied), Original MM pickup and electronics. Strung with Ernie Ball Cobalt flats. No real major dings, but a couple on the rear from a belt buckle or something (tried to show in the pics). Tuners have tarnished a bit over the years but overall the bass is in great condition for its age and sounds amazing. Price includes original MM hard case. Shipping at cost to buyer. 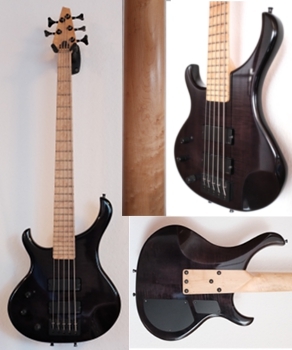 Body: solid light flamed maple with see-through black color. No dings, no dongs, just small scratches from normal use. Plays very easy and comfortable, but I dont play 5-strings anymore. Price: 1250 euro + shipping. Built in 1999 at the Unsung factory in Korea. It is a reference for quality! 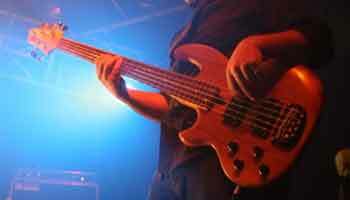 Round strings would: halfway between a heavily wooded P-bass sound and a solid body. A good mix ! Fender nylon flatwound strings : almost a double bass. frets and neck are in good condition, truss rod is works well, backside of the neck is not lacquered, only polished, like Stingrays, fast and very good feel, easy playable! There are no rust in the parts, Schaller licensed tuners. pickguard has a little dent. Equipped with new 45-105 strings, if you request I can restring and adjust to 40-100 set for free! If you've got any questions, feel free to ask! 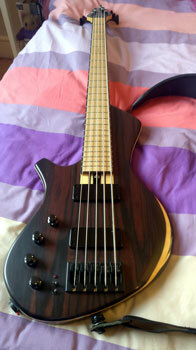 For sale my Wal Mk2 5 string bass, built in April 1991. Very good condition, everything works perfect. More information and pictures on request. I will ship worldwide, with insurance. Serial number R000288  Year 2004. This instrument is in a very good condition. It has the usual (very) minor user wear and a very tiny scratch of about 5 mm on the side (but hard to notice). Asking 650 euro, or a serious bid. If you are are interested, you can contact: hk2audio@gmail.com. I have more pictures on request. 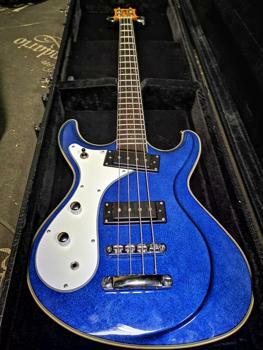 Dieser Hagstrom Swede Bass ist quasi Nagelneu, sowie das original Case auch. Gekauft in 2018, zwei mal live gespielt. Passt leider absolut nicht in den Band Sound, lässt sich aber richtig gut spielen. Er ist ordentlich wuchtig im Sound, es sind neue Billy Sheehan Signature Saiten auf dem Bass. Neuwertig, keine Gebrauchsspuren. Habe ihn aus Japan importieren lassen. Die Qualität / Verarbeitung ist überraschend gut! Das Modell wird nicht mehr hergestellt und ist daher nur noch realtiv schwer zu bekommen - schon gar nicht in diesem Zustand! Er wurde nur ca. 2 Stunden gespielt und steht seitdem im Case im Schrank. verbliebenen Löcher wurden so belassen; wer möchte kann die originalen Mechaniken also gern wieder montieren. Der JBV klingt wie ein amerikanischer Fender, vielleicht sogar eine Spur wärmer. Die H- Saite matscht nicht und passt klanglich gut zu den anderen. Der Preis ist 1100 Euro incl. ABS- Case und Versand innerhalb Deutschlands. No issues regarding electronics or with the bass. Bass works perfect. Has his dings after almost 35 years. Normal vintage looks.